What’s so thrilling about Spain are these vast, untamed parts of its interior. All-but-unknown Robledillo lies at the heart of the Sierra de Gata, yet is still within easy reach of Salamanca and Portugal. This village - one of the region’s prettiest - makes much use of the local slate; it may be christened arquitectura negra by the locals but it is far from gloomy. Here is an inn where you can self-cater in a warm and rustic style. The tiny restaurant has heavy old beams, subtle lighting and excellent regional food. "One hundred per cent natural products," says Caridad, who has pillaged the family recipe books for your benefit; there’s plenty for vegetarians to get excited about, too, and no less a man than Cervantes was fond of the local wines. 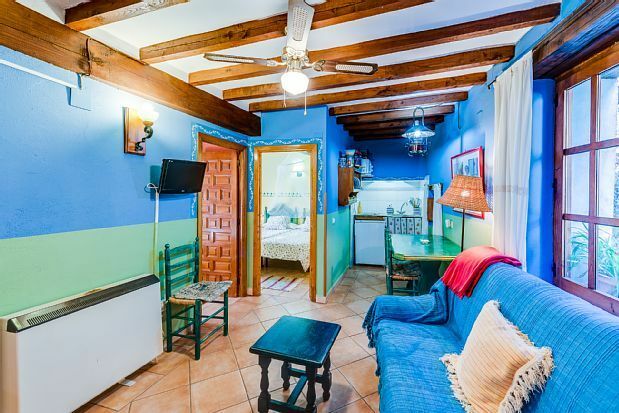 The apartments vary in size and layout following the dictates of the original building, but all have a cheerful décor, good kitchens, central heating and views. The latest edition is a little cabin for two. You are surrounded by forests of oaks, olive groves and vineyards, wonderful for horse riding or bikes. And there’s a natural swimming pool close by.